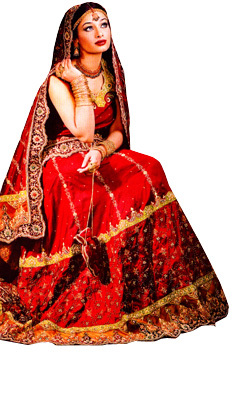 India has been known to have wonderful dresses and costumes. Though the majority of Indian women wear traditional costumes, the men in India can be found in more conventional western clothing. 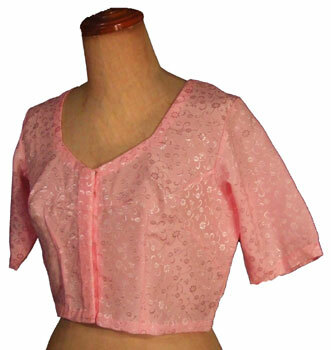 Tailored clothing is very common in India as women's blouses have to be made-to-fit. Clothing for both men and women has evolved and is keeping designers busy. How to wear a Sari ? The traditional Indian dress is the Sari which can be worn in many ways. Underneath the sari one wears a Petticoat: - a waist-to-floor length skirt, tied tightly at the waist by a drawstring and a Choli : a blouse that ends just below the bust. The Salwar Kameej is the second most popular dress and is gaining in popularity fast with the younger generation. The Salwar Kameej too has had many design changes. The new designers have come up with great variations of the Salwar Kameej. Women also wear Lehangas. The Sari : The age old Sari has kept its popularity throughout the centuries because of its total simplicity and practical comfort, combined with the sense of luxury and sense of sexuality a woman experiences. For a single length of material, the sari is the most versatile garment in existence. A sari is a rectangular piece of cloth which is five to six yards in length. The style, color and texture of this cloth varies and it might be made from cotton, silk or one of the several man-made materials. The sari has an ageless charm since it is not cut or tailored for a particular size. Any unstitched fabric in history has somehow been given sacred overtones. The belief was that the unstitched fabric was pure. This garment can fit any size and if worn properly can accentuate or conceal. This supremely graceful traditional dress can also be worn in several ways : Maharashtrian : Navvari, Gujarati style, Bengali style, Kerala style, Irula style, Pinkosa (farmer) style, etc. Thus there are many ways of wearing a sari, as well as its color and texture. It could be of shimmering silk or the finest gauzy cotton. Perhaps a pastel-hued solid color or a myriad of woven flowers. It may even be embroidered with golden threads, or finished with a richly tasseled border. The way and kind the sari worn is very much indicative of the status, age, occupation, region and religion of a woman and is true especially in India. One of the famous "Sari legends" has been described in the 5,000 year old Indian epic, the Mahabharat. Legend has it that when the beautiful Draupadi - wife of the Pandavas -was lost to the enemy clan in a gambling duel. Lord Krishna promised to protect her virtue. The enemy was determined on "bagging" their prize, caught one end of the sari that draped her so demurely, and pulled and pulled at it to unravel. They continued to pull and unravel, but could reach no end. Thus protecting her virtue. Gujarati way: This version of draping, commonly known as the seedha pallu way, is also found in parts of Uttar Pradesh, Madhya Pradesh, Rajasthan and Bihar. Instead of opening to the left, the pleats are tucked so that they open to the right. Then, the pallu is taken to the back and brought over the right shoulder. It is then spread across the chest, and the left edge is tucked in the petticoat at the back. 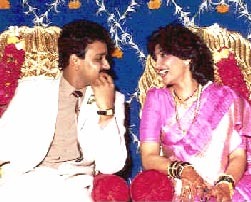 Maharashtra method: Instead of the usual five-and-a-half meters, the sari in this version measures eight meters. One portion of the sari is drawn up between the legs and tucked in behind at the waist, while another portion is draped as a pallu over the bosom. Thus it forms a kind of divided sari, allowing greater freedom of movement. Tamilian version: Like the Maharashtra version, the sare in this version, too, measures eight meters. After wrapping around the waist, the pleats are positioned along the left leg. The rest of the sari is taken over the left shoulder, wrapped once again round the waist and tucked on the left side. Bengali style: The sari is worn pleatless; it is wrapped around the waist, brought back to the right side and the pallu is thrown over the left shoulder. The pallu is then brought up under the right arm and once again cast over the left shoulder. Tie the petticoat tightly at the waist. Tuck the top right corner of the sari into the petticoat at the navel and wrap it around the waist anti clockwise once. Make sure the lower end of the sari touches the floor. At the tucked-in end hold the top edge of the sari with right hand between stretched forefinger and thumb and start making pleats. Make about 6 pleats of about 6 inches wide each, hold them together at the navel level and ensure they fall evenly on the floor. Crease the pleats with your hand to ensure that they stay that way. Tuck the pleats together into the petticoat, keeping the navel at the center of the pleats. The tucked-in pleats should spread like a Chinese fan as they fall towards the floor. (Its a good idea to pin your pleats together at the top with a big 'safety' pin before tucking into the petticoat). Drape the remaining fabric around the waist anti-clockwise once more and take it over your left shoulder so that it falls on your back and goes down till your knees. Secure the portion of the fabric on your left shoulder by pinning it to the blouse at the shoulder with a small 'safety' pin. This helps keep the "pallu" in place. Enjoy wearing this beautiful piece of clothing. The Sherwani : a coat like garment, worn by men, fitted close to the body, of knee-length or longer and opening in front with button-fastenings. Below the men wear a garment for the lower part of the body, baggy and wide at the top tied with a string at the waist , and tight around the legs and ankles. It is avery elegant dress for the men and mostly worn during ceremonies.